Leonardo, Raph and Don investigate the mausoleum that they’ve set up shop in, searching for signs of intrusion. Leonardo goes off on his own, fearing that Raph and Don’s armor isn’t stealthy enough. The ninja returns a few minutes later, holding the culprits: two rabbits. Don states that he has to go to Pittsburgh to get some parts. Raphael tells his brothers that he’s got to get back to training his Foot Soldiers. Leonardo wants to go along and help out, but Raph refuses the offer, telling Leo that there can only be one person giving orders – and the Foot have chosen Raph. Leo is dejected, but he realizes that Raphael is right. Don offers to take Leo with him to Pittsburgh, but Leo says he doesn’t want to sit for that long, so he heads into the sewers to get some exercise as Don flies off in the car. Nearby, we see two men in black suits and sunglasses spying on the Turtles. As Leonardo walks through the sewer, he’s suddenly shot! A group of hunters are there and they begin to chase the turtle. Leo takes cover and then spots another group of men carrying firearms – the ninja decides he needs to get out of the sewer. Leo climbs a ladder, but as soon as he lifts the manhole cover, he’s spotted by yet another group of hunters on the street! Leonardo avoids the men and takes cover in an alley, before escaping their pursuit and heading over to Casey and April’s apartment. Unfortunately, as the turtle tries to grab the fire escape bars outside Casey’s bathroom window, he slips and falls. Casey is shaving inside and congratulates himself for thinking of putting Vaseline on the fire escape to warn him of would-be attackers. Jones calls out a threat to the intruder, as Leo sticks his head through the open window and tells Caseyto cool it, as he’s got an armful of buckshot that needs attention. As Casey tends to Leo’s wounds, he reveals that there have been reports of giant alligators that killed and ate two children playing in the sewers. 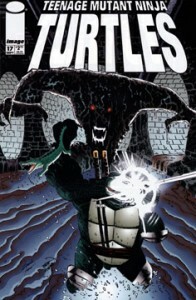 Leo skoffs at the notion, stating that the Turtles killed off all the gators in the sewers when they were kids. After getting patched up and saying goodnight to Shadow, Leo heads down to Mikey’s apartment. There he finds Mike hard at work on his new novel (which is why he wasn’t with his brothers earlier). Leonardo is visibly upset that Mike is “wasting” his time writing, but Mike won’t budge on the matter. As the two argue, Splinter calls out to them to quit fighting. Leonardo goes into the next room and we see Master Splinter, back to his normal mutated form, resting in a rocking chair with Klunk the cat on his lap. Leo apologizes to his Sensei for the disruption and they briefly discuss the giant gator threat. Splinter tells Leo the men are seeking a reward for capturing the creature, and Leonardo insists there are no giant alligators in the sewer… but Splinter reminds him of one… Leatherhead! Leo decides he has to find Leatherhead immediately and find out what’s going on. He asks Mike to go along, but Mikey wants to keep writing. Leo is once again upset by this. Casey and April arrive with a pizza, and Leonardo asks Jones if he wants to assist him in the hunt for Leatherhead – but Casey has to work later and can’t go until the morning. Leo gets angry, proclaiming that Leatherhead could be dead by morning and then stalks off, slamming the door behind him. Casey and Mike consider going after the angry ninja, but Splinter tells them they have their own affairs to attend to. But much to Leonardo’s surprise, Leatherhead is bound and gagged. As the mutant gator tries to warn Leo, the ninja is attacked from behind by Lord Komodo and his komodo dragon minions!